As website users we know how frustrating it is to read information on a company's website just to find that information is out of date and no longer accurate when we arrive at the store. As a business it is important that the information we provide to the public to be correct and up to date. A website built on a CMS can help achieve this. A Content Management System or CMS is website software that stores your site content in a database, enables simple editing for you or your web content managers, and we work in the background to keep your site source code up to date and secure. Anyone with knowledge of how to use a basic wysiwyg editor can log in and edit the site content. This ensures that your content stays up to date with your most current business information. 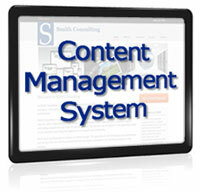 You even have the ability to add new content or even new pages to your site. No more waiting for and paying for your website designer to go in and make simple textual changes to your content. A CMS also makes it easier to change the design of your website. The content of your site and the code that stores the design of your site are seperate. So when you’re ready to change your site appearance, a new design can be applied without a major overhaul.